Creating, editing and annotating PDF documents becomes just as easy as exporting them for further processing in Microsoft Word or other applications. Ashampoo PDF always delivers excellent results - whether you're working with text and images, replace fonts, modify layouts or rearrange the pages in a document. Convert your PDFs into text documents editable with MS Office or Ashampoo Office. HTML, EPUB, JPG or RTF are also supported as output formats. Ashampoo PDF Professional furthermore supports optical character recognition to convert your scans into editable and searchable documents. 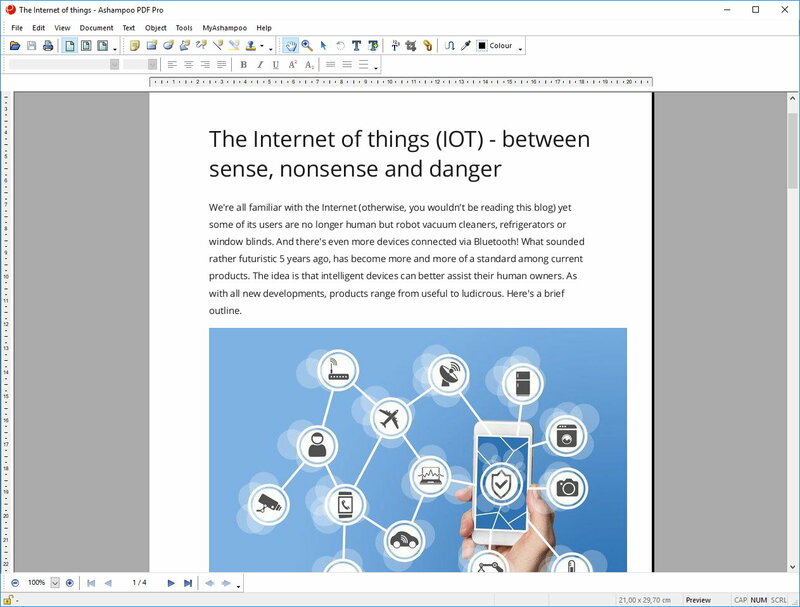 Create high-quality PDFs from any Windows application. Simply click "Print" and select the included Ashampoo PDF virtual printer. If size matters, Ashampoo PDF can automatically downsample images, e.g. to facilitate online publishing. Not only can you fill out interactive forms but Ashampoo PDF Pro also supports the more common forms that were created as PDF documents as used by various government agencies. Save time and fill out your forms on your PC instead of printing and filling them out the old-fashioned way.